1-1/4" x 12-1/2" 1-1/4" x 12" 1-1/4" x 9-1/2" 1-1/8" x 12-1/2" 1-1/8" x 12" 1-1/8" x 9-1/2" 1" x 12-1/2" 1" x 12" 1" x 9-1/2"
Functional system for holding an assortment of four beverages or two drinks and a pair of binoculars. Early morning coffee? No problem. 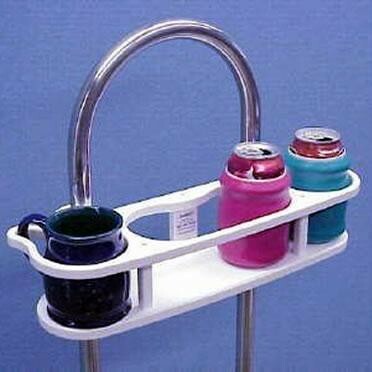 This unit is designed to accommodate mugs! It snaps directly to the pedestal guard, no other mounting hardware is needed and NO drilling. Order for specific tube diameter and center to center spacing. Note: The 12" & 12-1/2" size is not returnable because of incorrect measurements. For this item, these sizes are rare and this item is custom made per your order. Be sure you measure properly per the FAQ below.